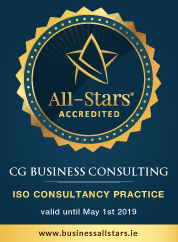 Your organisation could benefit from a FREE ISO Integrated Management System Consultation with CG Business Consulting. What is ISO Integrated Management System? An ISO Integrated Management System is a management system that integrates all of an organisation’s systems and processes in to one complete framework. Integrating Quality (ISO 9001), Environment (ISO 14001) and Health and Safety (OHSAS 18001), or any two of the standards is an Integrated Management System. The Environment (ISO 14001) and Health and Safety (OHSAS 18001) standards were designed to be compatible with ISO 9001 Quality Management Standard. As some of the requirements and clauses overlap across the three standards this enables the systems to be integrated seamlessly. Integration brings together the processes of these systems for effective business management thus you get excellent value for money for having an integrated management system. Easier to manage as company has one system as oppose to three separate management systems. Reduction in cost, disruption and time involved with auditing as you have one audit for the three standards.